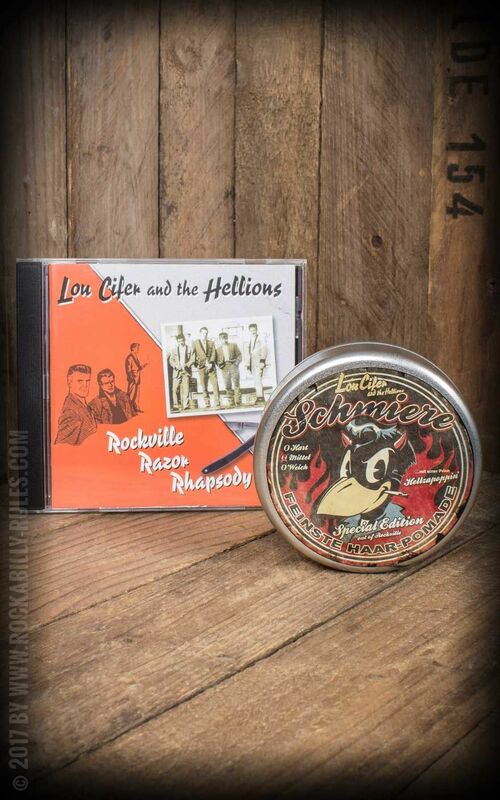 The perfect bundle for all lovers of Schmiere pomades and Teddyboy Rock?n?Roll! 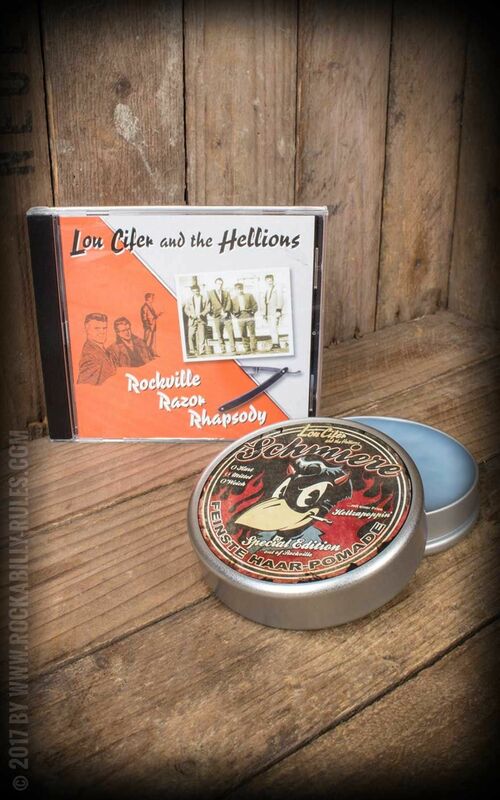 One CD of the german ruhr area cult band plus the "Schmiere Special Edition - Lou Cifer" pomade. Save 6,- Euro of the unit price with this great combination! 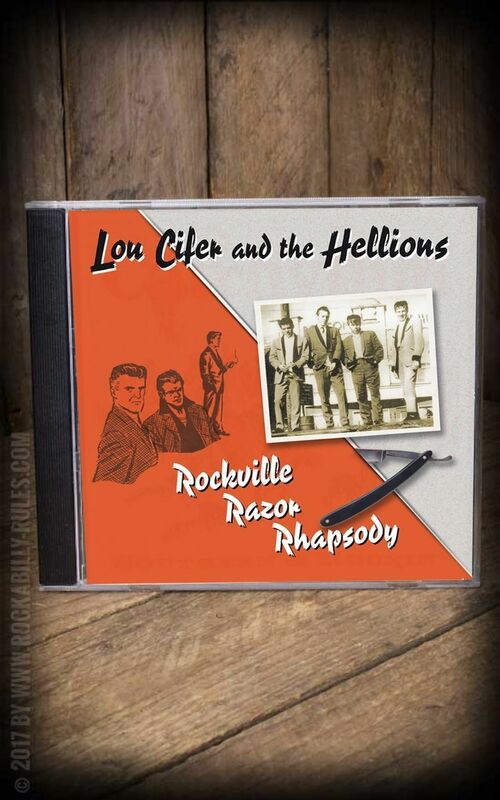 The new medium Schmiere "Special Edition Lou Cifer and the Hellions" conjures a new era! 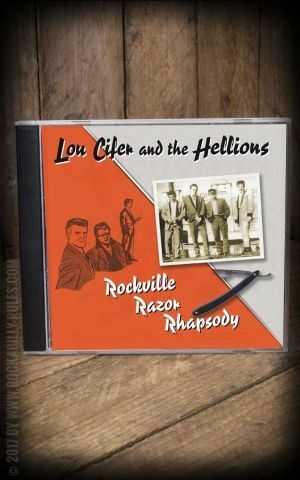 What fateful coincidence drove the sly Schmiere raven to one of Lou Cifer and the Hellions concerts. As soon as the dancefloor was burning from the raging Teddyboy-Rock'n'Roll, the devilish inspiration struck the raven's mind: A legendary mixture of Rock'n'Roll and finest pomade on the occasion of the 20th anniversary of Lou Cifer! True to the motto: Rumble59 Schmiere - For greasy guys and sophisticated ladies - 'Cause this diabolic Schmiere lives up to its promise! 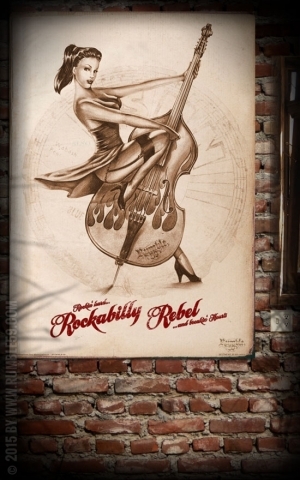 Satan said: "May the Rock'n'Roll not only do it's devious work in your ears and with your feet, but also on your heads! 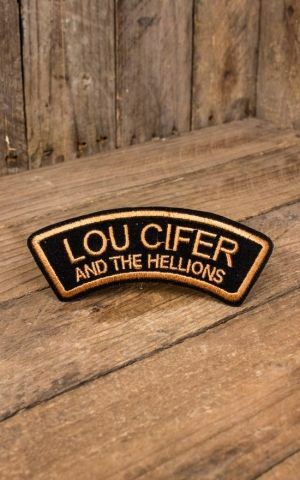 To all you daredevils out there: Follow my command and praise the new Special Edition Lou Cifer!" But only those who are faithful will be privileged to get their hands on this pomade so that their hairstyles may be perfect. Of course the result will convince you too! 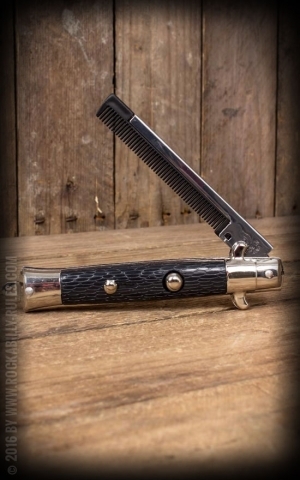 : Schmiere (medium) isn't only for teddyboy hairstyles but also for all classic ones. It cares for medium hold and brilliance. Schmiere by Rumble59 could be applied on the hair very easily and is very economically regarding the application. It has a yummy smell which could only be designed by the devil himself! 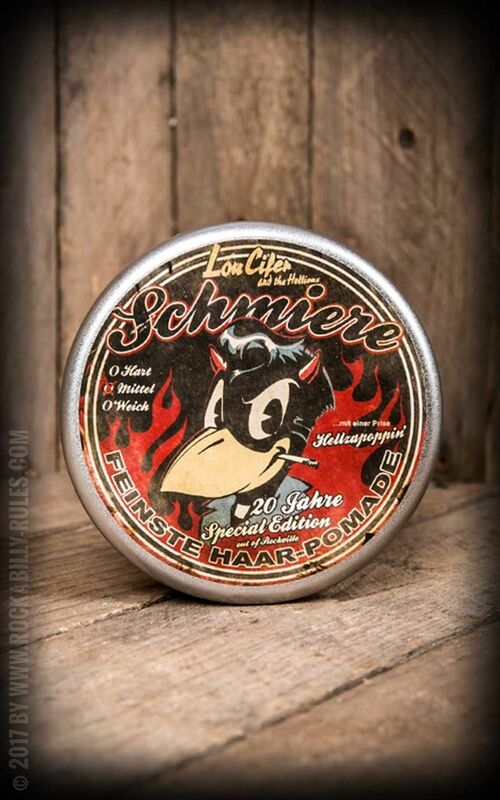 The Schmiere pomades are packed in a cool and shatter-proof can: It's perfect to take it with you wherever you like! The expressive and satanic horned likeness of the Schmiere raven looks from this tin - straight out of hell! Fiery side effects may occur! 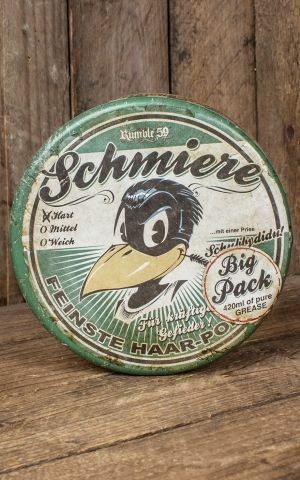 Colour, smell & consistency of Schmiere "medium"
Ingredients of the Schmiere Pomade "Medium"
All Schmiere pomades are made in Germany. Of course these pomades are certified according the European Cosmetics Regulations. 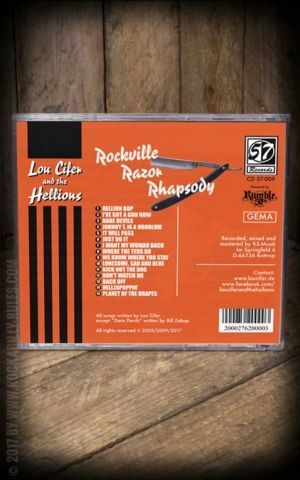 Now available at www.rockabilly-rules.com - for more rockabilly in your life! Its creamy and medium consistency is perfectly suited to shape normal and thick hair to a pompadour. Of course other classic hairstyles are possible too! 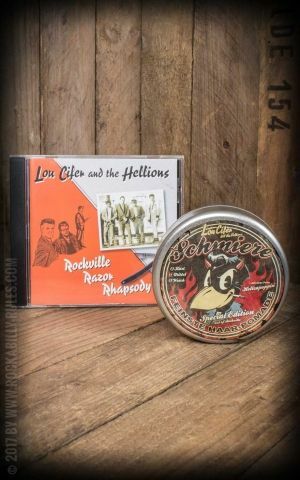 (We advise: If you've got very thick or unruly hair you'd better take the Rumble59 Schmiere Pomade strong.) Schmiere doesn't dry out the hair. Once applied on the hair the Schmiere holds the whole day long without getting hard-dry. While making your hair hold all day long it stays flexible at the same time. The Schmiere Pomade medium could be applied on the hair very easily and is very economically regarding the application. Even beginners won't have difficulties to spread the pomade over their hair. 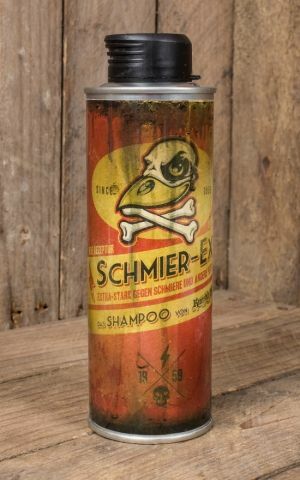 Unlike other pomades this "Schmiere" can be washed-out easier. Mostly one application lasts only for one day. Tip: Just regrease and the hairstyle is perfect again! Reading the booklet creates the impression that this record is a concept album, and maybe this is true. It is the first record the band recorded with the original line-up after taking a break for a few years. The song "Where The Teds Go", a club hit, has already been covered a few times. Again, the booklet includes all lyrics and cool artwork. By the way, the pressing company which pressed the first version burnt down, but the band swears that it had nothing to do with it. And how is it called? and the girls were worth fighting for. and a tooth for a tooth. in a town named Rockville ..."
They never wanted to be a commercial successful band and yet - or maybe because of that - they enjoy cult status internationally. Mission accomplished! An English rock'n'roll magazine nailed it and ranked the quartet among the hottest bands of the scene. Since 1995, they have been distilling their distinctive sound in the dusty coal cellars and dark bomb shelters of the Ruhr Area in Germany. Many of their old albums are out of stock and now highly coveted collectibles. These albums will be finally released again on CD. Super! Endlich alle 5 sets zusammen. Jedes set hat auch seine Daseinsberechtigung! Gut mittelfeste Pomade und unschlagbaren TeddyboyRock'n'Roll. Sollte man zumindest mal reingehört haben.